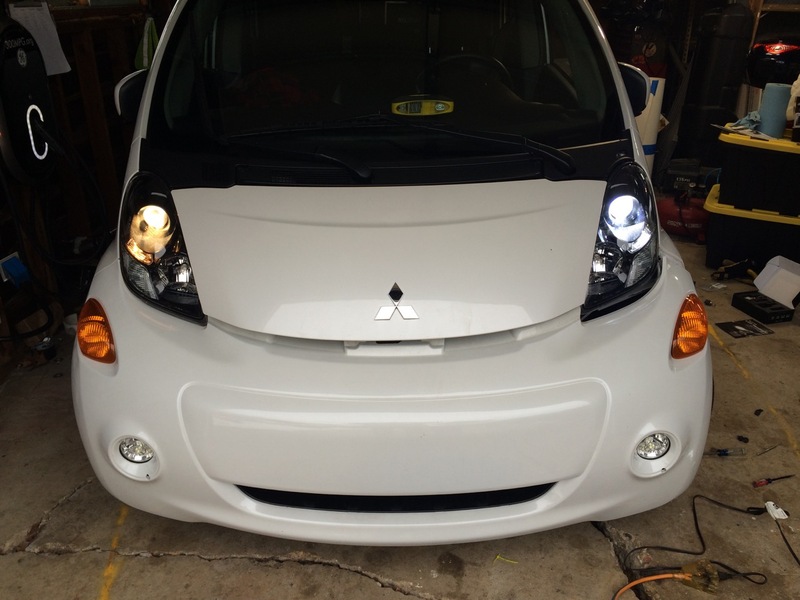 Recently, I did a few small LED lighting upgrades to my electric car. 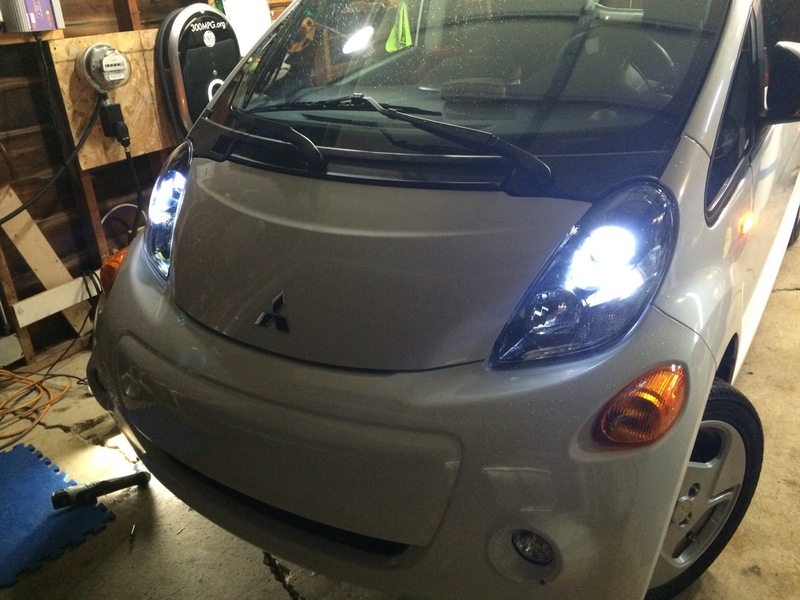 Those went well, so I thought I would tackle the big one: Installing LED DRIVING LIGHTS! And I thought it would be easy…. The car has separate bulbs for the low beam, high beam, and parking light. My plan was to upgrade the low beam and parking lights with equivalent LEDs. 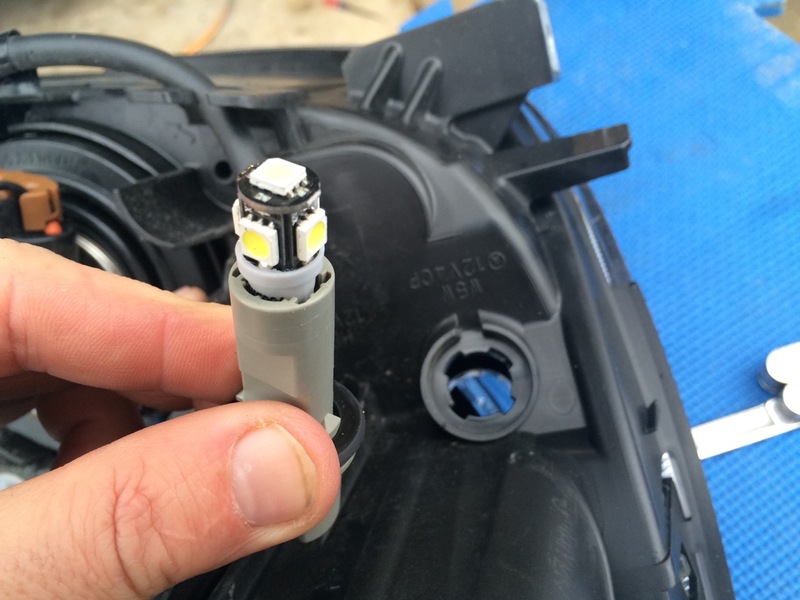 Even then, there’s a little plastic hook at the top of the light, NOT MENTIONED ANYWHERE IN THE SERVICE MANUAL, which prevents a person from removing the headlight without a particular arcane technique of pushing, pulling, and lifting the headlight, all at the same time. I did happen to get ONE of the two headlights out WITHOUT breaking off the plastic hook. Since there appears to be no function to this hook, other than to get you to pay dealer prices to have a new headlight put in, it really wasn’t a loss. The replacement LED bulb looks HUGE in comparison to the original halogen bulb. Fortunately, there’s plenty of space inside the low beam housing. The trickiest part was the fact that the short wiring pig-tail on the LED bulb came out at a right angle and was very stiff. I had to tuck in the tail first to be able to get the LED bulb in at all. Once it was in, I could then pull the pig tail out and plug it in to the wiring harness. With that, I screwed the cover back on. I removed the original 5W5 bulb by rotating the holder counter clockwise and pulling it out. I removed the bulb and then inserted the LED version. Next, I set the headlight assembly back roughly in place, and reconnected the wire harness, so that I could test the lights. I turned the lights on and was pleased by the instant bright light from the low beam, but the parking light DIDN’T come on! I removed it from the housing, this time letting the bulb hang on the wire, but outside the housing, for more easy access and testing. Figuring that LEDs are DC electronics, where polarity can be important, I SPUN the bulb 180 degrees, and then turn the lights back on. Nothing! It still didn’t light. Did I perhaps pinch a wire or cause a short? I put the original bulb back in. That lit up just fine. So, did I have a bad LED bulb? I took the LED over to a known good power supply (a 12V battery in my Elec-Trak E15 electric lawn tractor) and connected it with two jumper wires. It didn’t light up. I swapped the wires to reverse the polarity. LIGHT! So, the LED bulb DOES work, but it also DOES have a particular polarity, it just doesn’t work when I plug it in to the car!?!? I examined the bulb and realized that the two wires coming out of it are rather thin. They are also not glued or otherwise held in a very particular position. It looked like when I installed the bulb, one of the wires would naturally bend AWAY from the conductor in the socket in the car. I simply gave a slight bend to the wire to center it and make sure it would make good contact, then put it back in. With a flick of the car’s light switch, the bulb came right on. I also wanted to replace the side marker light with the same W5W LED bulbs. 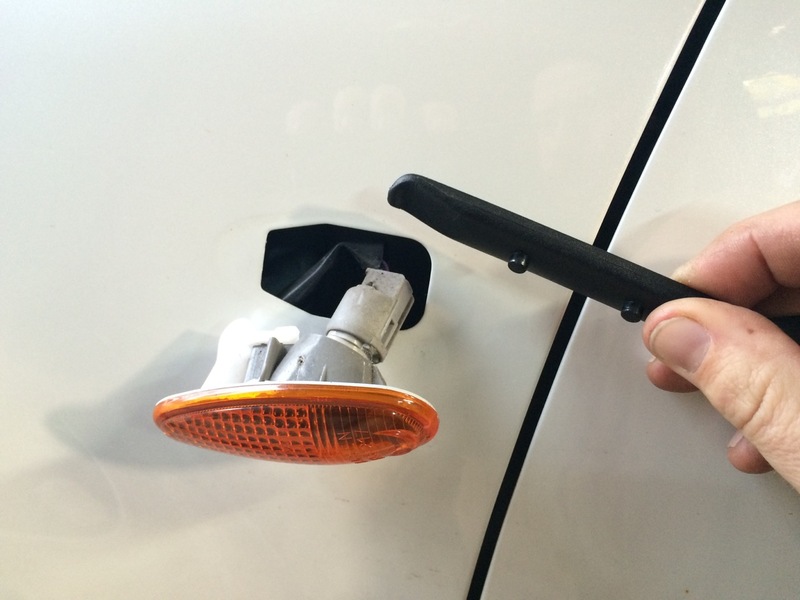 The side marker light on the car can be replaced by sliding the assembly toward the front of the car (to the left in the photo) to compress a springy plastic part on the front, and unhook the back. With the light out, I unplugged the wire harness, removed the bulb from the holder, and put in the LED bulb. When I went to put the bulb back in the light housing, it wouldn’t fit! 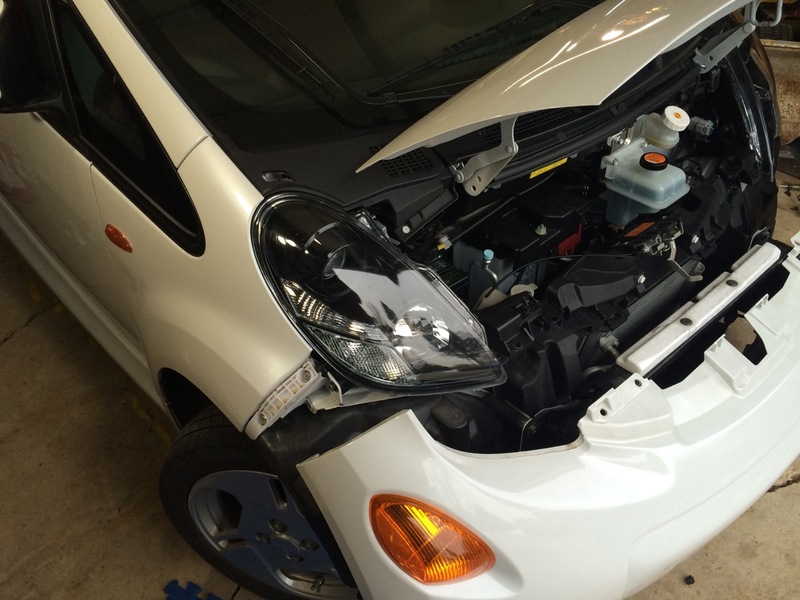 Similar to trying to get the LED in the Daytime Running Light, the bulb just wouldn’t go all the way in! This time, it was the actual length of the LED bulb itself. Inside the housing, the LED would hit the plastic lens BEFORE the base could engage and lock in place. I wouldn’t be able to use these LED bulbs in the side marker lights. I put the original bulb back in and clipped the housing back in place in the side of the car. On the passenger side of the car, I got ready to remove the entire bumper cover. On the driver side, I had only removed enough fasteners to get the bumper cover out of the general area of the headlight and get access to all three bolts. Since that side was already loose, and I would have to at LEAST to the same on the passenger side, I figured that I may as well remove the entire bumper cover. It’s not too difficult, but it’s a fair number of fasteners to remove. I didn’t bother to remove the fasteners at the very bottom of the front of both wheel wells. This let me get the bumper cover completely out of the way, yet without having to drop it on the ground. Finally, I removed the three bolts holding in the headlight assembly. Only that stupid little plastic hook kept the light in place. I moved the light in different directions, to see how it would effect the hook, yet none of them released it. Finally, I managed to figure it out, and I pulled the headlight free WITHOUT breaking the hook. I believe that I pushed the headlamp all the way back, pushed down on the front, and then lifted on the back. Likely, I will never be able to repeat this feat. I replaced the driving light low beam with the LED. This one didn’t feel like it fit as well. Twisting the bulb into place, it didn’t seem to have as much resistance against the gasket at the first bulb did. I’ll have to keep an eye on this bulb and make sure that vibration doesn’t cause it to rotate by itself. As for the running light bulb, I made sure to pre-bend the wires on the LED so that they would make good contact in the socket. I then tested the lights, and when that bulb didn’t come on, I spun it. With the new polarity, the bulb came right on. After testing to see that all the lights were working properly, I fully reinstalled both headlights, tightening down all three bolts on each. When I went to pull the bumper cover back in place, I could NOT get it to go back on. I tugged and pried and tried to see what was catching. It turns out that there’s three fasteners right in the middle of the bumper cover that stick into the steel bumper itself. The middle one is a spike of plastic that needs to exactly go back into a hole. With the bottom of the bumper cover still fastened, I couldn’t get the angle to make it line back up. 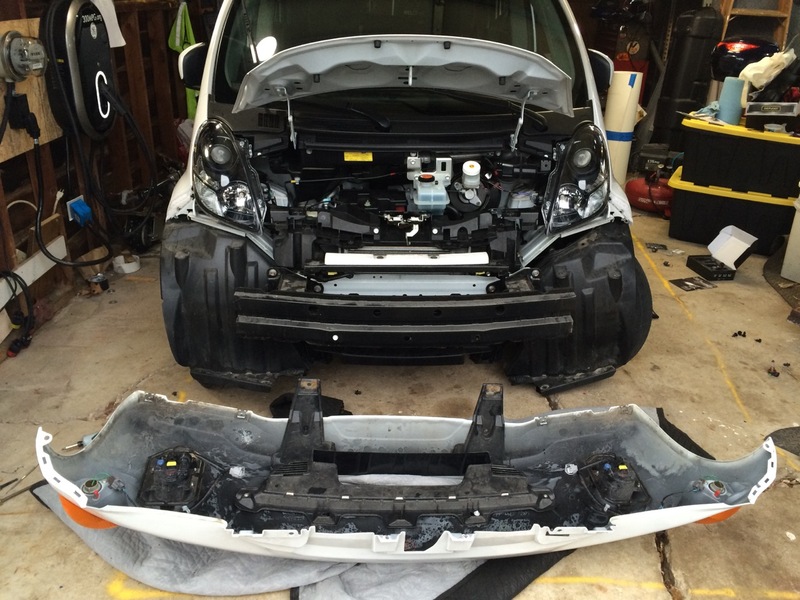 Instead, I would have to remove the few remaining fasteners on the very bottom of the bumper cover, disconnect the wiring harness to the Fog Lights (which are built in to the bumper cover), and remove the whole thing to be able to properly re-install it! At that point, the entire front of my car looked like it was missing, all just to replace a few light bulbs! I wrestled the cover back on, aligning the center plastic pin back into its hole in the bumper and then replacing the myriad of fasteners to completely reinstall the cover. Finally, my car was all back together. I turned on the headlights so that I could get a couple of photos showing the complete LED upgrade. That’s when I saw that they didn’t all work. The passenger daytime running light was out. The driver side marker light was out. When I tested the turn signals, the right turn signal was out and the right-rear signal blinked twice as fast as it should have! And I just spent the last 20 minutes putting every last screw and fastener in! I went back inside the house to warm up, get some dinner, and take a break from the project. Afterwards, I had decided that perhaps this wasn’t such a big job to fix the non-working lights. I had an idea as to what might cause all these problems. I removed the fasteners from the passenger side fender liner, to get at the back of the passenger side fog-light assembly. Sure enough. It wasn’t plugged in. I had to unplug it to fully remove the bumper cover. When I put the cover back on, I hadn’t inserting the electrical connector far enough for it to click in place, and it had come back out. I plugged it in fully, then tested the lights. The Daytime Running light worked again, as did the turn signal. The side marker light was still out. I figured that the side marker was probably just a bad connection. I removed it, inspected the bulb, pulled it out, put it back in made sure the wiring connection was solid, and put it all back together. Worked fine after that. 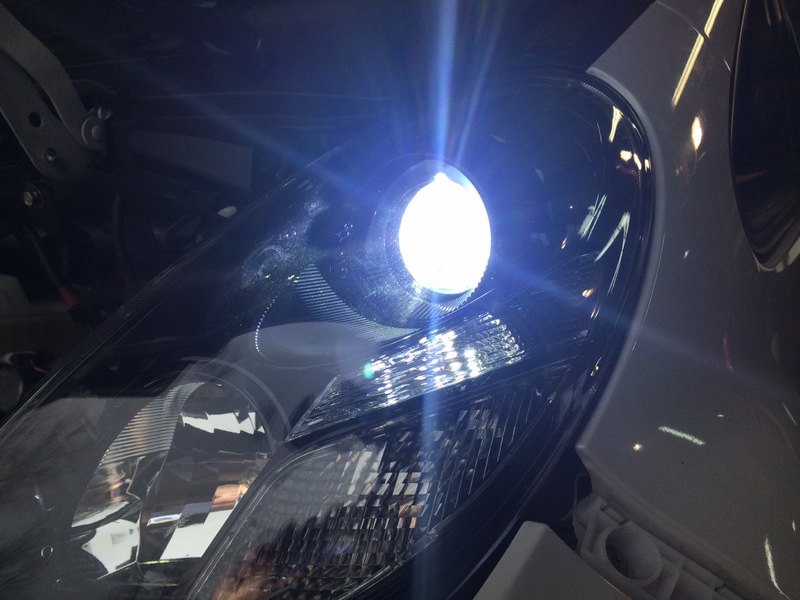 The shape of the projection of the LED headlights looks VERY similar to that of the original halogen bulbs. I was glad to see that, as it was my primary concern. It seems like the single biggest issue right now with upgrading headlights to LED is that the reflectors are designed to work with bulbs of a very particular size and shape. By their nature, LED bulbs are simply NOT the same size and shape as the halogen. So, there’s big possibility that the reflectors will simply NOT reflect the light the way they were intended. I was pleased to see that these bulbs appeared to work well with the projection lenses and reflectors. As for the BRIGHTNESS of the headlights, it’s hard to say. The bulbs are RATED at 2000 lumens. That SHOULD be brighter than the typical 1400 lumens of an average H11 bulb. But it didn’t LOOK like it was! The eye also perceives the intensity of different colors of light differently. Due to the complexity of the headlight installation, I wasn’t able to simply put in ONE LED headlight and drive around comparing the light from one side of the car with the other. After I had the first LED bulb in, I did just look at both bulbs (one halogen and one LED) and they looked very similar, other than color. There was also a very light rain. It seems to me that all headlights are darker when it’s raining out. Besides that, I was mostly driving in town, where there are streetlights, many of which are now also LED, or least more of a “daylight” color. That might also have been skewing my subjective comparison. One thing I did notice is that reflective objects at a distance (street signs, reflectors on mailboxes, etc.) seemed to show up better with the LEDs than the original halogen lights. I think the LEDs may also light up just a little better to the SIDES of the car – a benefit to spotting deer trying to cross the road at night. Again, all of this is based on one short ride into town at night in a light rain. I’ll have to do some more driving to give a really fair comparison. Take a look through all of my photos and see for yourself. Till next time, stay charged up! Broken piece held back in place. 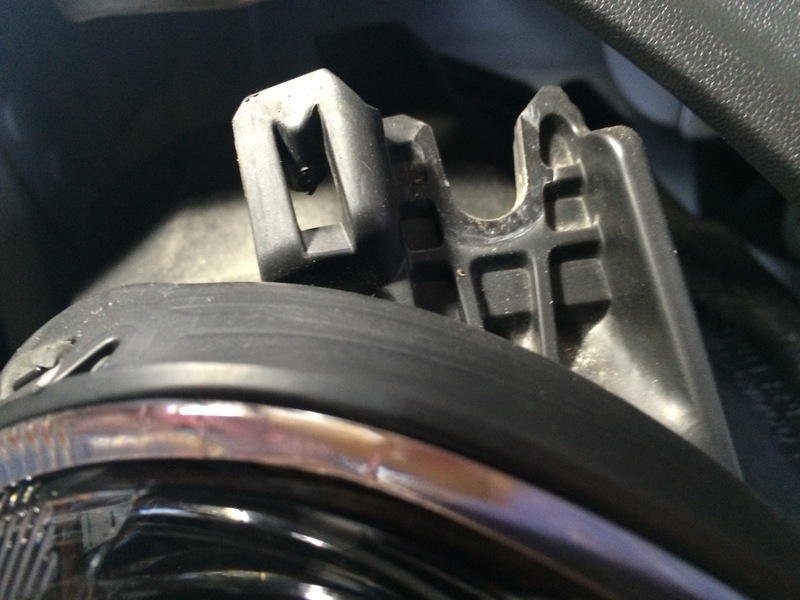 Empty socket where headlight was. 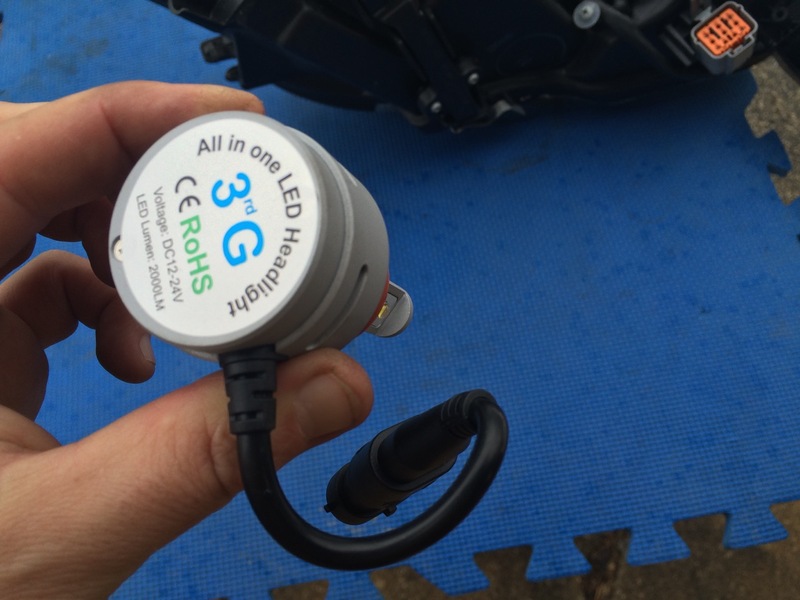 LED bulb for parking light. One of each, side by side. Subjectively they look equally bright. One incandescent parking light, one LED parking light. Tool for removing side marker light. I used a plastic bike tire tool. LED W5W bulb in side marker, but won’t fit in housing. Close-up of the NON-broken hook on passenger side. Lit up LED parking light. Wowza. All this just to change a light bulb! 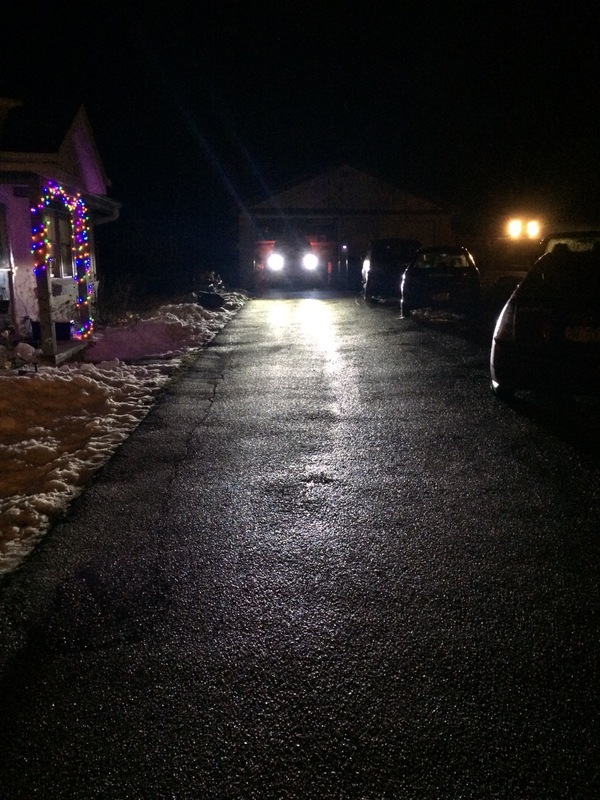 What my driveway looks like the LED headlights on it. LED DRLs and LED Parking lights. LED driving lights and LED parking lights. 3rd Gen All in one bulb, featuring CREE LEDs. Notice has small/thin/bendable the wire on this LED bulb is. If you got H11 bulbs with the four loops of copper braid heatsinks, would there be room and sufficient air flow? Can you hear the fans on the bulbs you have? Any energy savings is good, but the savings of ~35W per bulb is not noticeable in the range, but the light is better and any savings is better than none! Hi Neil, as you say, the power savings is nothing compared to how much energy the electric motor uses (or even the heater!) I mostly have been doing these LED upgrades for LOOKS. But I’ll take the free energy savings! If the car is parked, and nothing else is making noise, I can hear the fans in the lights on the outside of the car. I haven’t noticed them from inside the car. It’s very quiet. If ANYTHING else is making noise (including the Pedestrian Alert UFO noise this car makes,) you can NOT hear the fans in the LED bulbs. I’m not sure about how much space the bulbs with the copper braid heatsinks would take up, as I simply don’t have any in front of me and have never seen them in person. In this application, I think the LEDs with the fans in them are a better choice. Yes, I actually can hear the LED headlight fans inside the car. It’s a low pitch steady whir. If it was a gas car, I wouldn’t be able to hear it at all. Next post: Too Cold for EVs?